Firefighters from the Stirling Volunteer Fire Co. and the Basking Ridge Fire Dept. jointly participated in a unique training exercise sponsored by the NJ Transit Police & Rescue Unit demonstrating the various ways to rescue passengers from an overturned railroad passenger car. 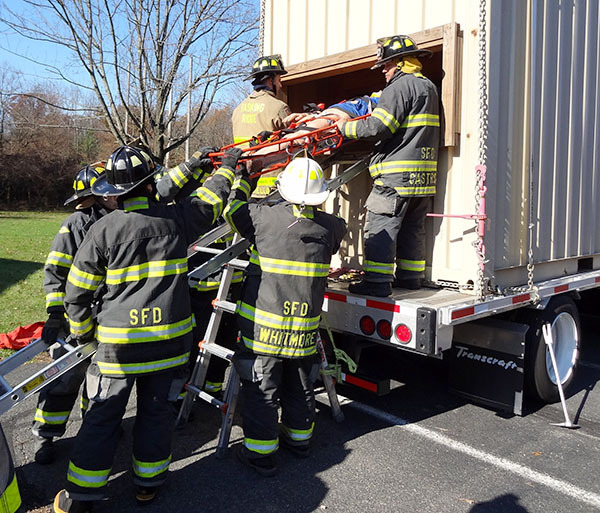 Following a one hour classroom presentation the firefighters walked into the large parking lot where an almost full size railroad passenger car was laying on its side on a NJ Transit flatbed tractor trailer. It was specially designed for training first responders. The exercise allowed the firefighters to simulate a difficult rescue, where the overturned car and small doors made getting to the injured passengers and evacuating them very challenging. The members of the two fire departments working cooperatively, used various types of equipment and stretchers to extricate the injured and move them to a triage area. After a few hours of very realistic training, the firefighters and first aid members thanked the NJ Transit Police & Heavy Rescue training team for a very enlightening and valuable training exercise, one whose procedures are easily transferred to rescuing people from buses and other incidents. Stirling firefighters who participated in this training were Chief Kevin Phillips, Assistant Chief John Whitmore, Captain Randy Wojtech, Mike Batog, Dawher Castro, Jack Dede, Frank Reilly, Steve Remington, and Jack Remington. (above) Firefighters from Stirling and Basking Ridge participating in a training to rescue passengers from an overturned railroad passenger car.